Mondrian Doha is an innovative new hotel based in Doha, Qatar, and offering guests a unique glimpse into the luxury world of this glorious city. Featuring 211 bedrooms and 59 suites over 24 floors, the region’s very first ESPA, and a spectacular 2000 square metre ballroom with its own 24K gold elevator, Mondrian Doha redefines lifestyle in the thriving hub that is Doha city. Mondrian Doha is always at the heart of the most exciting cultural scenes in the world serving up innovation and creativity for everyone. As such, the establishment provides a playful framework so that guests and locals alike can immerse themselves in the culture of each city it inhabits. 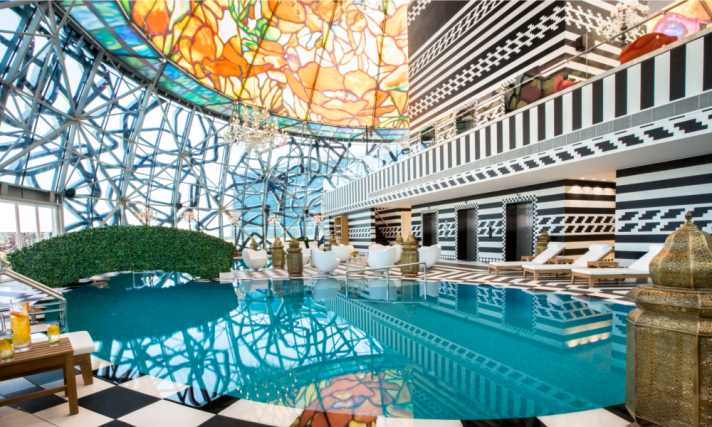 Designed by Marcel Wanders, this stunning hotel perfectly combines timeless style with local flourishes to create a unique take on the Arabian Nights. The designs and concept of Mondrian Doha take guests on a One Thousand and One Nights experience, an ancient story of fables where the limits of escapism is only in the imagination. Visitors can suspend belief, revel in wonderment and get carried away turning the pages of a new story. As a pioneer in Doha’s thriving hotel space, Mondrain Doha boasts the largest spa in the region, and for the first time couples are allowed to enjoy a massage together. ESPA at Mondrian Doha delivers an unforgettable wellness experience hidden in a “Secret Garden”. Shimmering mosaic walls lead guests to the 12 treatment rooms, a heated experience garden, relaxation rooms and a traditional Turkish Hammam. To provide guests with a truly relaxing and rejuvenating experience, ESPA has over 3,500 highly trained therapists administering over three million treatments per year. They pride themselves on getting to know their customer’s skin and body in order to learn what will work best to express their natural beauty. ESPA create all of their own products using only the very purest extracts for instant, lasting results, every day. Alongside the region’s first couple’s spa room, there are also separate male and female saps, for those seeking solitude in their pampering. Featuring five treatment rooms and one VIP treatment suite with two treatment rooms, the female spa is a haven of peace and purity. Beautiful white and pink mosaic walls create the perfect feminine energy and guide ladies through their journey of rejuvenation.